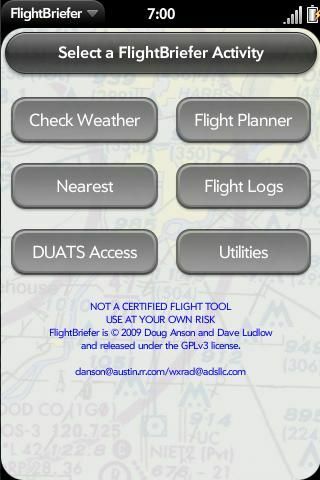 We are proud to release FlightBriefer version 1.0.4. Minor updates to app menus for (eventual) Palm catalog inclusion. Additionally, updates to the log entry functions to enable easier log entry. Tested on Pixi resolutions. Lastly, added list scroll fading as an indicator of lists that extend beyond the screen. Enjoy! We are proud to release FlightBriefer version 1.0.2. We have made MANY updates and changes since 0.1.6 - too many to list here. Feedback/comments appreciated! Notable additions in v1.0.2 include: more DUATS integration, radically updated flight log (now in sync with FlightLog's functionality), and several new weather links. NOTE: You MUST delete your old version FIRST, then install the new version. This is REQUIRED. WARNING: As a result of the install, your existing flight log WILL NOT be preserved. So, record any entries you desire to retain prior to the re-install process. We are sorry for any inconvenience this may cause you. Renamed from PreFlight to FlightBriefer to avoid trademark issues. Improved TAF report handling when no TAF is available. METARs now show 6 hours of history. Virtually the entire app is now portrait/landscape aware. A SourceForge.net page has been created for tracking bugs and feature requests - please don't be shy!